Press Pass LA was invited to Universal Studios this week, to meet the cast of their two new comedies Telenovela (premiering on December 7 at 10 p.m.) and Superstore (premiering on November 20 at 10 p.m.) both on NBC. The lovely afternoon included Q&A panels with both shows, as well as a mingle and meet and greet with the cast and producers. The day began with the Telenovela panel, starring Eva Longoria who is also a producer on the show. The show is a comedy about Ana Sofia (Longoria), the star of a hit telenovela, and how the hilarious and over the top actors and crew all work together in attempt to steal the spotlight. Telenovela marks Longoria’s first TV role since Desperate Housewives and many want to know, why now? What is it about this project that was so special to make Longoria return to the small screen? Longoria clued us in as to what she has been doing the past few years and why Telenovela is what finally drove her to go back to her roots. Eva Longoria returns to TV in NBC’s Telenovela. “I left Housewives three or four years ago, focused on my charity work and was traveling the world. I then started directing and producing Devious Maids and other projects, and I knew I wanted to return to television, it is my favorite medium of content, television is at it’s best right now. I knew I would go back and do a comedy because I had such a great time on Housewives,” she notes. The amazing ensemble cast also includes Jencarlos Canela, Diana Maria Riva, Jose Moreno Brooks, Alex Meneses, Amaury Nolasco, Jadyn Douglas and Izzy Diaz. America Ferrera stars in NBC’s newest workplace comedy Superstore. After a lovely mingle with the cast, we got to sit down for another Q&A with the cast and creator of Superstore starring America Ferrera (Ugly Betty) and Ben Feldman (Drop Dead Diva, Mad Men). 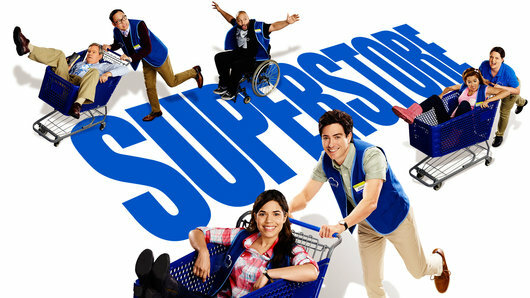 Superstore is a hilarious workplace comedy (produced by Justin Spitzer of The Office) about a unique and lovable group of employees at a superstore. In addition to Ferrera and Feldman, the cast also includes Mark McKinney, Lauren Ash, Colton Dunn, Nichole Bloom and Nico Santos. Need more convincing? Watch the hilarious trailers below!